Lena Jones works as a private investigator in Scottsdale, Arizona. Her business, Desert Investigations, is a two person operation. She's assisted in her duties by her partner, Jimmy Sisiwan, who is proud of his Pima Indian heritage. 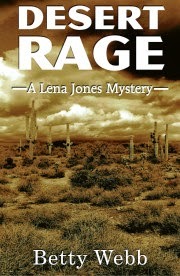 Their latest adventures take place in the book Desert Rage, the eighth Lena Jones adventure. The book starts out on an unsettling note, when 14 year old Allison Cameron and her boyfriend Kyle Gibbs take her gravely injured dog Misty to the vet. They are very concerned about the welfare of the dog, but the fact that the bodies of Allison's parents and 10 year old brother are in the house with them doesn't seem to bother them very much. After dropping off the dog, they attempt to flee to California, but are caught and returned to Scottsdale. Once in custody, both confess to the brutal beating deaths of the family. Lena is contacted by Representative Juliana Thorsson and asked to investigate the case. Thorsson has been a very outspoken politician in the area, and is gearing up for a run for the Senate. She confides in Lena that while a struggling college student, she was an egg donor for her sister and for the Cameron family. Allison is her biological daughter. She hadn't been in contact with the family, but she happened to see Allison and her mother in a store one day, and due to the family resemblance, she quickly realized Allison was her daughter. She also believes that the girl is incapable of killing her family. When Lena begins investigating the case, one of her first stops is the juvenile detention center to interview Allison. Allison is defiant and sticks to her confession, claiming that she hired a "hit man" with her allowance money. The family had been bound, gagged and tortured before being killed, and Lena doubts a hit man would have taken so much trouble (even if he would work for allowance money!). It's also odd that Kyle, a foster child who loves animals, would have hurt Misty the dog while killing the family. Lena's research finds that the father of the family, an emotionally remote but gifted emergency room physician, has a secret second job. This leads to a line of inquiry that finds plenty of new suspects with a reason to want Dr. Cameron and his family dead. While investigating the murders, Lena also has personal problems to deal with. As a child she had been found in the street with a gunshot wound to the head, and nothing is known of her family. She grew up in foster care, where she was terribly abused in some of the placements. One of her foster mothers, Madeline, regards her as a true daughter and is a frequent source of friendship and support. Lena still continues to have nightmares about her early childhood, though. Also, she gains an enemy when she has a car towed that is illegally parked in front of her office. That leads to all sorts of physical and property-related problems . . . Even though this book is part of a series, I enjoyed reading it. It's obvious that the author has a true love for the southwest culture and history (although perhaps not the climate!) and it has made me want to visit Scottsdale -- although probably not in July! I plan to go back and read the other books in the series to get caught up, and I look forward to finding out more about Lena's past in the upcoming books.